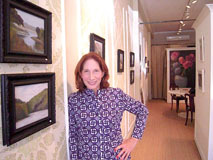 Marcie Bronkar’s new Art Salon at 128 ½ N. Larchmont Blvd. adds a touch of culture and refinement to the street. Open late, business has been brisk as people have dinner across the street then wander over, have a glass of wine and look at the paintings. On view are oil landscapes and ink drawings by Elizabeth Tucker, mostly small, “little jewels,” except the “Large Hydrangeas” that fill a wall. Bronkar is also exhibiting a few of her own works, soft pastels described as “Rothkoesque… He was my mentor,” says Bronkar of Mark Rothko. Photography will be featured in the next show, opening in mid September, followed by a surreal and abstract expressionist exhibit coming in time for Halloween. Hours are Thursdays and Fridays 5 to 9 p.m., Saturdays 11 a.m. to 5 p.m. and Sundays noon to 2 p.m. Visit myartsalon.com.